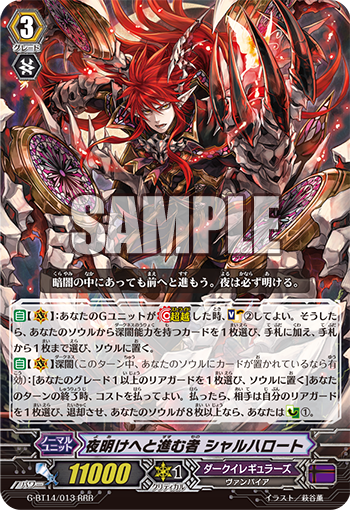 Today we have Scharhrot’s newest Grade 3 form and more. AUTO (VC) When your G unit Stride, you may Soul Charge 2. Then, choose one card in your soul with the Darkness ability, add it to your hand, and put up to one card from your hand into your soul. AUTO (VC) Darkness [Choose one of your grade 1 or higher rear-guards, and put it into your soul] At the end of your turn, you may pay the cost. If your do, your opponent chooses one of his or her rear-guards and retires it, and if you have eight or more cards in your soul, Counter Charge 1. AUTO When this unit is placed on (RC), if you have a vanguard with the Darkness ability, you may check the top five cards of your deck. If you do, put up to two grade 1 or higher cards with the Darkness ability from among them into your soul, and shuffle your deck. CONT (RC) Generation Break 1 Darkness This unit gets Power+2000.